FES писал(а): Не разделяю это мнение, кого интересует бред из 32 века, когда можно получить полную инфу по одному из пяти классических домов вселенной. Не понимаю, почему бред из 3067-го года лучше бреда из 3130-го, и чем они оба хуже бреда из 3050-го или 3030-го. Классикой БТ был и остался 3025-й год, остальное -- клятый модерн. Между прочим, хандбуки по всем пяти Домам на 25-й год у нас есть. Всё, что стоит прочесть, уже написано в Коране. Что не написано в Коране -- читать не надо. Я считаю наиболее полезными во всех смыслах книги тех годов, где есть информация обо всех существующих на тот момент фракциях и инфа подробная. (пример серия филд мануалов, серия рапортов сейчас выходящаая по производству). Это я так думаю. Мне наиболее полезна полная картина вселенно на определенный год, впихнуть в одну книгу это нельзя. На ралпате в этот уикенд, все заказы свыше 25 фунтов отправляются бесплатно по всему миру! Лучше бы это был Варстор. Все что мне надо из старья я на ближайший месяц уже взял. Да и цены за пересылку у РП очень скромные, 2-3 фунта. Hey there folks, here's a quick look into my current workload to give you an idea of what's coming down the line. Feel free to ask my any questions, but mind you I might not know the answer or I may not be able to answer—yet. BattleTech Introductory Box Set: Let me quote Randall, "it's all printed and ready to get on a boat but Chinese New Year shuts all manufacturing down for like 3 weeks. Waiting for them to come back up mid February and get an update on when it'll be on a ship heading to the States!" However, I think it's at the end of February, not mid-February when they reopen. Field Report 2765: AFFS: This one is so close I can taste it. Just need some minor art, and it's ready for publication. Might have it out by the weekend, but definitely by next week. Historical: Wars of the Republic: All art is completed and and text is flowed through; we're waiting on one (or more) map(s) for the Victoria War section, and we're finalizing a couple record sheets. With that I should be able to hammer home the layout. A release of next week is possible. Randall's been posting some art previews for this book via social media (including work-in-progress shots of the cover by Alex Iglesias) You can check it out here. Alpha Strike Revised Point Value System (Beta): Pretty excited about this one. We'll be releasing a new Alpha Strike PV system to public beta test. It's actually been ready to go for a little over a week or two, I just need to turn it into a presentable PDF. This could happen any time from now until the next week or so. Handbook House Kurita: It's been on the backburner a while, with the writing complete and awaiting artwork. Happy to say that Randall and Ben have been generating art notes and the cover is already in progress by the talented Jonathan González Gómez/Brother Ostavia). No way I can give an ETA for this one, and there's still tons of work ahead, but it's once again in motion. Alpha Strike Companion: Another one I'm very excited about (seeing a pattern? ), we've got a final (or near final) outline and writing is set to begin shortly. I'll see if perhaps we can post an outline or maybe divulge some of the proposed contents. Cover assigned to Alex Iglesias and he's already turned in some sketches. Interstellar Operations: Not much to say here except I know Herb has been hard at work on it. Experimental Technical Readout: Gunslingers: This one is waiting on artwork and then layout. It was unfortunately sidelined for a while but should be back in production soon. Experimental Technical Readout: Primitives IV: Production on this one has just started. Writing is either complete or nearly complete, Justin Nelson has started the artwork and then it's just record sheets and layout. Can't nail down an ETA just yet. Era Digest: Dark Ages: This one is just within my radar (actually Herb has a better handle on it), I believe we may be waiting on some rules tweaks, and then record sheets and layout. We've also got quite a few things in motion or in the planning stages for Alpha Strike support. I'll see what I'm able to discuss. It may be old news to some, but an Alpha Strike data package was released for Lone Wolf's Army Builder software, thanks to the hard work of Demo Team Agent Jim Williamson. The Master Unit List now has the option to filter searches with Alpha Strike special abilities. That's huge. We've also got a fun CamoSpecs project coming up, hope to announce that soon. Thanks again for all your patience and support! Вкратце - возможно на следующей неделе увидим "Войны Республики" . И перевод этой статьи, кто не смог в буржуйский. Аааааргх! Как же меня накаляет, когда при переводе все гиперссылки превращают в обычный текст, словно на дворе 20 век, в итоге выглядит как статья из бумажной газеты. ЗЫ. Не говоря уже о полном игнорировании источника. 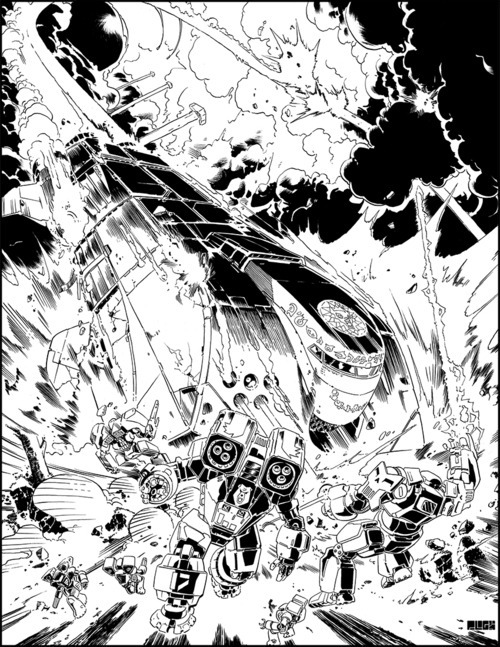 If I’m gonna share art for Shadowrun, seems only fair to share some art for an upcoming BattleTech book as well, The Wars of the Republic. Here’s the first of several I’ll float out in the near future. Ray Arrastia No Alpha Strike box set has been announced, there is no product at Catalyst with the sku "CYT35610" and there even have an MSRP for a product that doesn't exist. Рэй Аррастия на лицокниге: Не было объявлений по Альфастрайк бок сету, не существует товара у Каталистов с кодом CYT35610, и даже рекомендованной цены еще нет для продукта что не существует. Опа, кодик... И что-то подсказывает мне, что кто-то пропустил слово "еще"
With over a hundred full-length novels from dozens of authors, the BattleTech universe remains one of the most thoroughly fleshed-out and immersive sci-fi settings ever created. And we all have our favorite authors. For me, I’ve got numerous ‘favorites’. Robert Charrette’s seminal Heir to the Dragon; William H. Keith Jr.’s original Gray Death Legion Trilogy (I think I read Mercenary’s Star a dozen times in High School); Loren L. Coleman’s Double Blind (one of the best single novels in the entire setting); and so on. 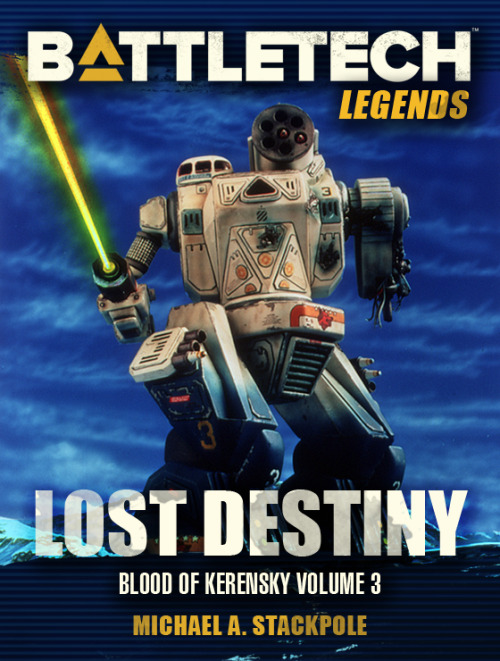 But even though I might have singular favorites from other authors, there’s no denying that for most BattleTech fans, there is only one king novelist. The one who scripted the biggest plots and crafted the largest changes within the BattleTech universe bar none…and that’s Michael Stackpole. I first met Mike at a small comic book store in downtown Tempe, AZ. His second Warrior Trilogy novel had just come out and I happen to come into the store and he was signing books; there was almost no one there as this was so early in the whole history of it all (1988 I believe). By the time Lethal Heritage came out in 1989 things were starting to change pretty fast; stood outside Game Depot (again, downtown Tempe) to get a signed copy. And over the years I’ve gotten to know Miche; called him friend; even had numerous chances to collaborate on BattleTech storylines. But no matter how easy-and-matter-a-fact I am with Mike, every now and then the 17-year-old that first bumped into him and realized that there were “people” behind these books…yeah, he giggles maniacally. 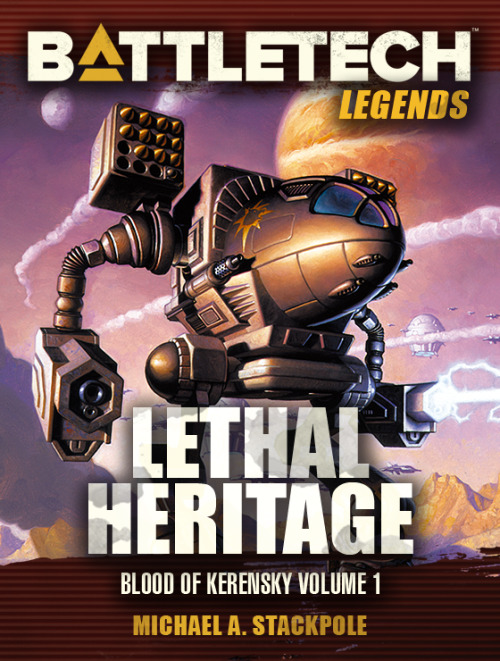 And I’m giggling right now as I’m pleased beyond words to finally start adding Stackpole’s great wealth of novels to our BattleTech Legends line. 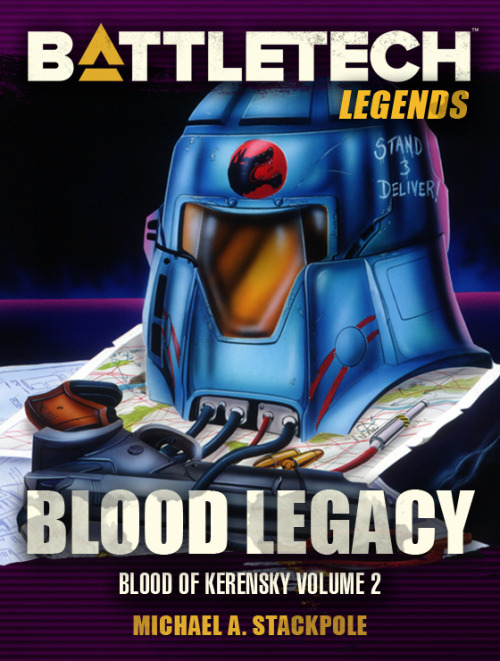 First up is the Blood of Kerensky trilogy…go grab your copies! The rest of his books will be flowing in the coming weeks as we continue to roll out the entire catalog! Бен Роум, начиная с сегодня, ушел с поста ассистента лайн девелопера БТ. В бэттлтехе больше не будет ни одного собственного лайн девелопера. Всеми играми теперь заведует Рэндалл Биллс. Мда, все хуже и хуже дела в царстве датском. ты эту новость в блоге Роума глянь. Для меня несколько стало неожиданным, что Херб не сам ушел, а его "ушли". и что Роума, как другана Херба, после этого держали в стороне и кормили навозом.